(contined from page 9) half, too, and his stock will go through the winter looking much better than he is used to seeing them in more northern latitudes. The great variety of crops that can he produced makes failure an impossibility if the crops are properly diversified. Here the barley of the north produces abundantly, growing beside the cotton and cane of the south. Rich with all of the endowments that nature can bestow, this is an especially favored locality and there is no reason for a man working his life away on the poor lands if he can possibly reach this county. An invitation is extended to a desirable class to come and make their homes in Noble county. Lands are not cheap, but they are very reasonable taking into consideration their many advantages, and will surely increase greatly in value when the county gets older. The price of one good farm in the states will buy two or three here and within the next ten years this order will be reversed. Don't you want to profit by such an investment. For further information address some friend or acquaintance or any real estate firm whose names appear in this paper. In making mention of the men who have taken an important part in developing Noble county and the city of Perry, Charles F. Colcord is worthy of distinguished notice. Mr. Colcord was known as a prominent Oklahoman before the opening of this country and it was indeed fortunate for this community that he located here and has done so much in identifying himself with the progress of Noble county. His farm, one and one-half miles west of the city, is the best improved in the county and now has all of the advantage of the most comfortable homes in the older settled state. He has an elegant residence, a fine orchard from which he harvested much valuable fruit this year and the outer convenience are all that could be wished for. He also owns valuable business property in the city. Mr. Colcord has given much attention to improved breeds of stock and, in company with another gentleman, has a section and a half of land stocked with short horn cattle. He also has a number of highly bred horses, and everytime he visits his native state, Kentucky, brings some of their best animals back with him. 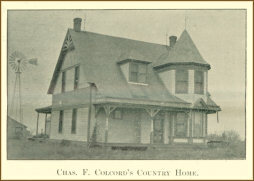 Mr. Colcord left Kentucky at 13 years of age, traveled through Texas, over plains, and with his father, Col. Colcord, located in Barber county, Kansas, where they engaged in the cattle business and were members of the Comanche County Pool, the largest cattle ranch in the west, for a number of years. He was at Wichita during the boom and went to Oklahoma City at the opening in 1889. He served as the first marshal elected in that city. Afterwards he was elected sheriff of the county, and upon Mr. Cleveland's election the second time to the presidency, he made a stroug canvass for marshal of the Territory and was only beaten by a force of circumstances. He is a sterling Democrat, takes an active part in politics and is recognized as a strong opponent and a fast friend. 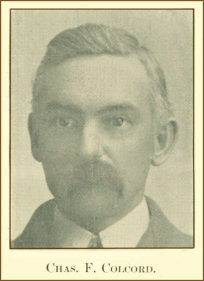 He was married in Kingman county, Kansas, in 1885, to Miss Hattie Scorebsly. They have a happy family of two bright boys and two pretty little girls. The farmers of Redrock Valley and surrounding country afford the convenience of a postoflice and good trading point through the enterprise of E. E. Van Slyke. The postoffice is called Ceres, and is situated thirteen miles north of Perry on the Arkansas City road. He carries a general stock of merchandise, such as meet the farmers wants. 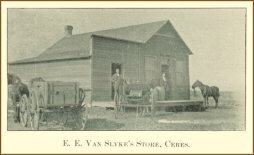 Mr. Van Slyke has a fine farm of 320 acres two miles east of Ceres. His place is well improved with buildings, wells and alfalfa. He threshed 1,200 bushels of wheat this year and raised forty acres of corn on the upland that produced thirty bushels to the acre, and he now has 115 acres of growing wheat. Mr. Van Slyke came here from Caldwell county, Missouri, and was formerly engaged in business in the town of Hamilton, fourteen years. He likes Oklahoma and is making a success of both farming and mercantile business. This gentleman occupies a most valuable claim in the Redrock valley near the reservation line. He has it well improved and is extensively engaged in the cattle business. 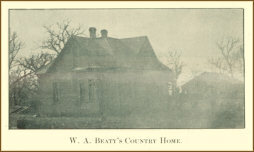 Mr. Beaty has resided in this county since 1882, and was one of Mr. Weatherspoon's "cow men." The beautiful farm upon which he has settled will repay him for the years of pioneer life and he is now surrounded by schools, churches, good neighbors and all of the benefits that can come from such associations. He is one of the substantial men of the county and a benefit to the community in which he resides. The bar of Perry and Noble county will compare favorably with that of any city in the Territory and one of its most successful. safe and reliable attorneys is Lane B. Osborn. 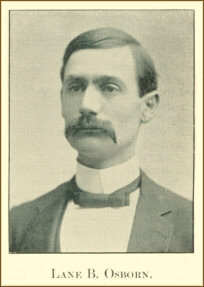 Mr. Osborn is a native of Spencer county, Indiana. He received his education in the common schools and at the Indiana State Normal at Terre Haute. He began the study of law in 1885. Four years later he was admitted to the bar at Rockport, Indiana. Following is what the Rockport (Ind.) Democrat, his old home paper, has to say of his ability: "Mr. Osborn has in a short time not only distinguished himself as one of the lending and able lawyers of the Rockport bar, but of the judicial district. He handles a case with great skill and dexterity and is a splendid trial lawyer. Being a good councelor and an efficient judge of the law his services have been sought in the most noted suits in the district." This reputation he has fully sustained in his practice here. Mr. Osborn came to Perry on the first train and during his residence here has conducted himself so as to merit the esteem of the bar and the people. He is a good business man as well as lawyer, honest and reliable. He gives especial attention to commercial and corporation law.